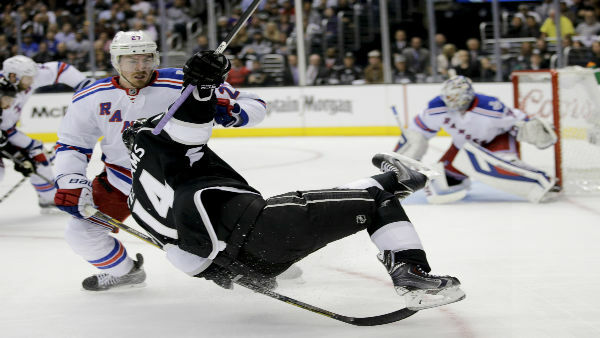 NEW YORK (WABC) -- Rangers captain Ryan McDonagh will miss Wednesdays game against the Carolina Hurricanes. The announcement came Tuesday following the teams practice. According to head coach Alain Vigneault, it has been something that has been hampering the Rangers defenseman for some time now. "It's something that has been there for a little bit, doesn't seem to be getting better right now. Our doctors are checking it out, and I'll have more for you tomorrow." When asked if McDonagh will be out for more than one game, Vigneault responded; "no idea". In addition to that McDonagh will not make the trip to Raleigh. With the loss of their captain for Wednesdays game, the defense will have to pick up their own game to fill that role. Kevin Shattenkirk said; "Huge void when he's out of the lineup. It's not just one guy who has to step in there and fill the role, it's going to be everyone." Shattenkirk went on to say; "He plays so many roles on this team, that each guy at different points is going to be asked to carry that." This comes at a time when the Rangers power play, is still this teams strength. Coming into Wednesdays game, the Blueshirts are 6th overall in the NHL. But recently it hasn't clicked like previous games. When Shattenkirk addressed his teams performance lately on the power play he said; "We haven't lost confidence, I think we know what the problem is. We know we need to be cleaner getting into the zone, our entries have been sloppy and it hasn't allowed us to set up." Shattenkirk went on to add; "I don't think we've lost any confidence through it, we know what needs to be worked on and we did a bunch of that today." Wednesdays game will be an opportunity for all the Rangers defensemen to get more ice time, as McDonagh usually logs between 22-28 minutes per game. Typically the most important minutes of the game as well. Face off is set for 7 p.m.